Guangzhou railway police have made arrests in an online train ticket website scam in which fraudsters sold fake tickets to university students in south China’s Hainan province, the News Express reports. Railway police have detained two suspects involved in the scam who scalped tickets and made fake ones in Wuhan, central China’s Hubei Province. Police also collected 680 tickets with an estimated value of 150,000 yuan (US$23,900). More than 600 students in Hainan Province bought the fake tickets online. A student surnamed Lin from Qiongzhou College in Hainan said he purchased 437 tickets worth 48,800 yuan for other students and himself from a man named Chen Mouchao in a university in Hainan through QQ, an instant message service. Chen told Lin that he could get student tickets from the railway station office at a discount. Meanwhile, another 200 students from a normal university also bought fake tickets from Chen. When Lin received the tickets, he found them to be quite different from real ones, so he went to the railway station to check their authenticity on January 7. When he discovered that all the tickets he purchased were fake, the railway police immediately set up a task force to investigate the matter. The railway police later arrested Chen Mouchao, who said he had purchased all the fake tickets from a netizen named "Tiaojiaofudi." After he sent all the information of the students to the netizen via QQ and remitted the money, Chen received a message to collect the tickets. 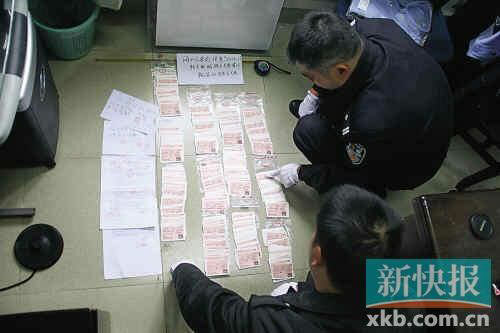 On January 19, Guangzhou railway police arrested the suspects who sold the fake tickets to Chen in Wuhan. A suspect surnamed Zhu has confessed to making the fake tickets. The case is still under investigation.